Crystal Palace extended their lead at the top of the Championship with a comfortable victory against Derby. The in-form Eagles have won 11 and drawn three of their last 14 matches and are two points clear of Cardiff, who beat Middlesbrough to go second. Glenn Murray headed Palace in front before Andre Moritz volleyed in the home side's second after the break. And, with nine minutes remaining, Murray wrapped up the three points with his seventh goal in four games. The victory was a third in as many matches for manager Ian Holloway since his arrival at Selhurst Park from Blackpool, a feat which owes much to the goalscoring form of Murray. The striker gave the Eagles an early lead when, left totally unmarked by the Derby defence, he headed home Yannick Bolasie's corner. The mid-table Rams could not cope with the hosts at set-pieces and Palace almost scored again when captain Mile Jedinak nodded wide from one corner, before Richard Keogh almost diverted into his own net from another. Eagles attacker Wilfried Zaha, who made his England debut in midweek against Sweden, showed glimpses of his creative ability but it fell to Moritz to double the lead. Moments after Keogh went close with a header for Derby, Damien Delaney's ball into the Rams area was headed down by Murray and Moritz finished with a fine left-footed volley. Like Murray, the Brazilian is enjoying life under Holloway, with that strike his third in three games and justifying the manager's decision to include him in the starting line-up. With eight minutes remaining Murray put the result beyond doubt with a strong run and shot into the roof of the net. 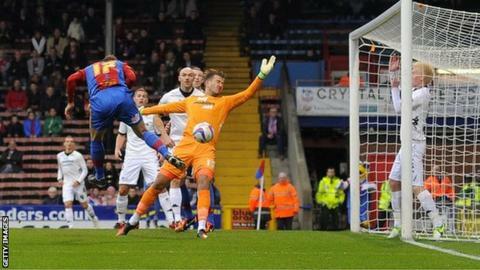 Crystal Palace boss Ian Holloway: "It's yet another fantastic performance against a good team. "They didn't stop from start to finish and the professionalism and determination to keep this run going is awesome and I have to say it's an absolute pleasure to watch them play at the moment. "So, very excited, well done, it's a great performance and it shows signs of being a bit more than solid." Derby boss Nigel Clough: "There was a lot of blocking going on which happens but sometimes you hope that you just get a referee which sees it, sometimes you don't. "But I can't have too many complaints, Murray's got a free header from eight yards out and having started quite brightly, we found ourselves one-nil down. "But after all the talk of the widemen all week and their threat, he was the difference - the centre forward Murray. He was the one that caused us all the problems."